kitchens (almost there) . 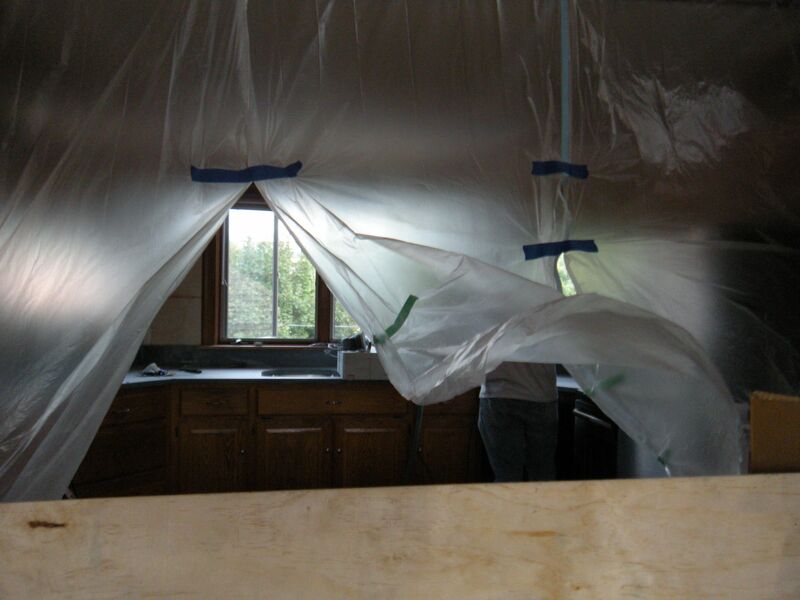 . .
plastic sheeting to contain honing dust . . .
After roughing in two-thirds of the countertop yesterday, the workmen were back here at 7 a.m. this morning. I was impressed. 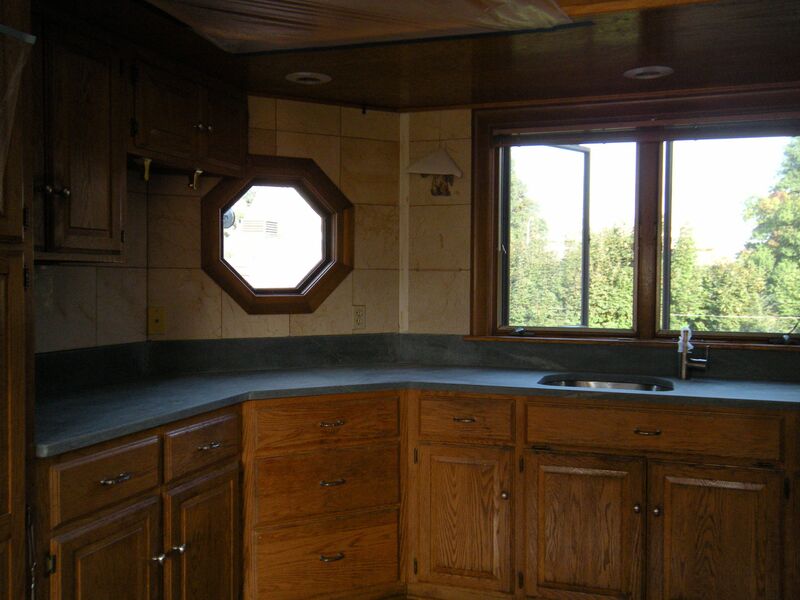 Two of them stayed to cut the remaining piece over the dishwasher and then fit the backsplash around the perimeter of the countertop.They mentioned it’s only the second octagonal countertop among thousands that they’ve done (most kitchens having square angles) and that it made the angle cuts for the back splash more challenging. It took them all afternoon to cut, install and hone the angled backsplash. The grain on the third piece fit in well with the other two. G., meanwhile, secured the dishwasher so that there was enough space to open the drawer and cabinet door next to it on the left hand side. We have our fingers crossed that the dishwasher, now anchored in place until there’s no tomorrow, will function properly once the water is hooked up again and it goes through its wash cycle. Our plumber will come tomorrow night to hook up the new faucet with the insinkerator and to move whatever pipes need to be repositioned given the new location of the faucet. After my physical therapy session this morning, I went to the grocery store and brought back salad and some roast turkey slices for the workers’ lunch. One of them declared that the salad dressing I made was “one of the ten best I’ve ever had!” and asked me for the recipe. I thought I’d include it in this post too. A dollop or two (or more) of honey—to taste, we like it slightly sweet and sour. You’ll know how much by tasting it after whisking the mixture with a fork. Sprinkle a little cracked pepper if desired. The guys seemed refreshed after they finished their lunch. I was surprised they were so health-conscious, eating an apple in the morning and drinking water the whole time. I left some more fruit and bottles of water outside on the front stoop to tide them over during the afternoon. Last night in artificial light, the raw, untreated stone looked more green than blue-grey. Once the plumbing is completed tomorrow night, we’ll use a special dry wax to cure and condition the surface of the stone on Friday. I’m remembering that pot of delicate, pale pink chrysanthemums I saw the other morning at Home Depot too. It will look gorgeous on the new countertop, won’t it? 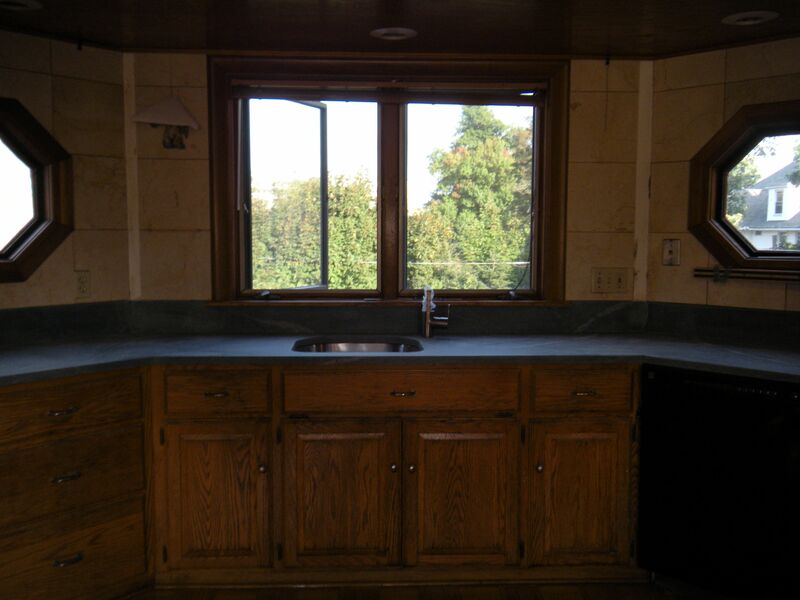 Here are a few photos of the raw soapstone countertop, completed but unwaxed. Photos of the finished countertop will be posted soon. left side raw countertop. 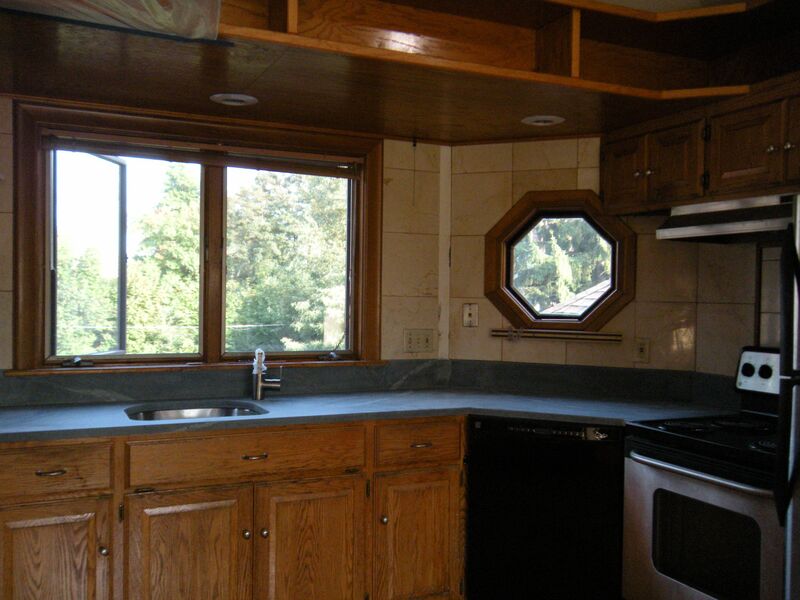 . .
center raw countertop . . .
right raw countertop . . .
Wow… it looks FANTASTIC! Can’t wait to see it in person. It’s fun to hear the tale of its installation, too… multiple faucets, healthy workmen and all. Congratulations!! Yes, dear . . . can’t wait for you to see it too! It’s been quite a saga but it seems that’s part of the process. It’s worth it, though! I just put on the first coat of dry wax and you should see it! See YOU soon too!